I recently adopted an adult, declawed cat. The shelter told me that he was leash-and-harness trained, and liked to take walks outside. This was great news, because I need a new cat-walking hobby (and/or side job). In my case, said cat doesn't actually seem to like his harness, so we have only been on very brief walks around the yard (I think I need a bigger/better harness). But I figured I'd look around for others who may have succeeded in this endeavor, because supposedly this is a thing I can do with my cat. You'll notice in this video that the cat freezes up when he's had enough. He just calls it quits. While I've never seen that in my own cat (mine just looks at me and meows, as if to say, "Take me home now" or perhaps, "Set me free, you monster!"). But this freezing/lying down is a clear bodily signal that the cat is not having it. There are good articles explaining why leash-walking an indoor cat can be a terrible idea. In summary, the night is dark and full of terrors outdoors is full of new, risky stuff. Your indoor cat likely doesn't know how to deal with other animals, puddles of antifreeze, or even diseases transmitted by contact with other cats. Also, your cat is not a pack animal, so dog-style walking is unlikely to be a behavior the cat will ever seek out. I have the luxury of a (relatively) safe back yard to walk my cat around in. But in New York City? Yikes. 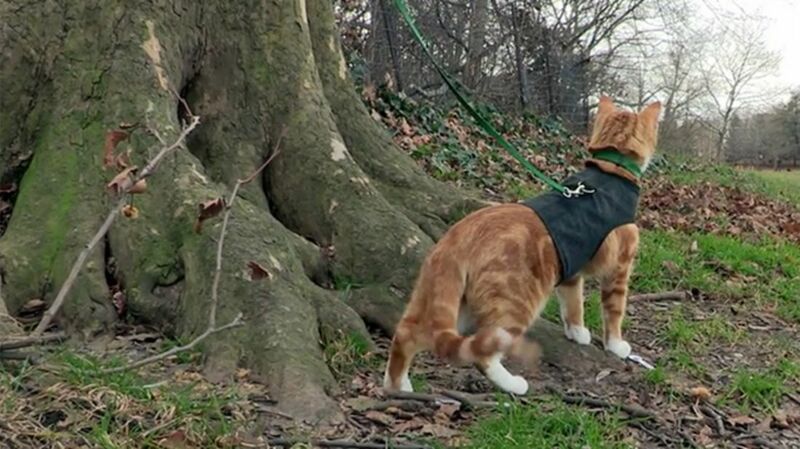 I'm curious—how many mental_floss readers have tried walking their cats, and how did it go? Let me know in the comments, please.